All documents can be created, uploaded, saved and stored in SpinOffice CRM and can be linked to one or multiple contacts or folders. It is even possible to open a document in SpinOffice; edit the document in MS Office Word/Excel; save and close the document; and SpinOffice uploads the latest version back into the application. As a result, every document is stored in the contacts’ archive and thus can be found easily. Keep in mind that documents will not be stored on your local disks but encrypted on our hosted servers. Personalized document templates can be created and automatically filled with contact data from SpinOffice. Create your own invoice, address label or quotation template. This saves you time and minimizes the risk of errors. In the Limited version you have a number of standard templates at your disposal. The ability to use unlimited number of templates and mail-merge fields is available when upgraded to our Pro version. This is a Pro feature. If you want to see all of the changes you and others have made to a document, spreadsheet, presentation, or drawing, you can check your revision history. You can view and revert back to earlier versions of your file and see which person made specific edits. Reverting your document to a previous version doesn’t eliminate any versions of your file, but it moves this previous version to the top of your revision history. 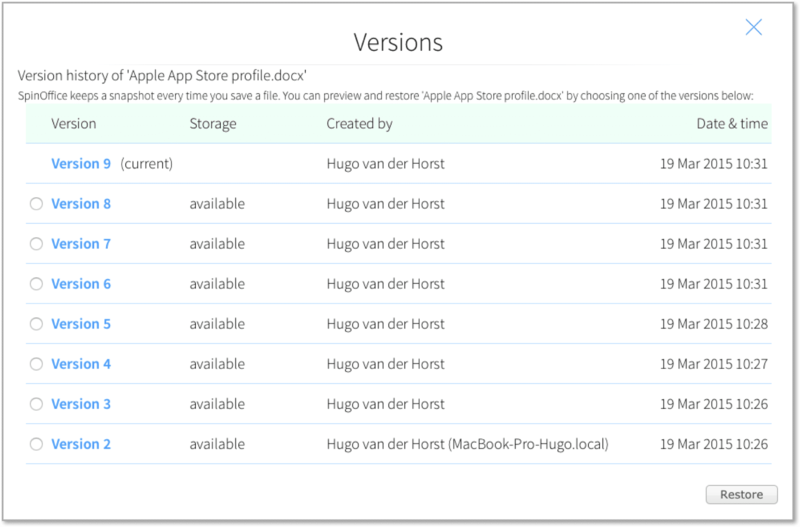 SpinOffice keeps snapshots of all changes made to files in your SpinOffice database within the past 5 days. After that, we move your document to a backup server for the next 100 days. Reverting back a file from there is possible but will take up to five hours.